Dapagliflozin is a potent and selective hSGLT2 inhibitor with EC50 of 1.1 nM, exhibiting 1200-fold selectivity over hSGLT1. Phase 4. (B) Clonogenic survival of prostate cancer cells treated with Canagliflozin, Dapagliflozin or Salicylate and expressed relative to the vehicle controls. Canagliflozin is a highly potent and selective SGLT2 inhibitor for hSGLT2 with IC50 of 2.2 nM in a cell-free assay, exhibits 413-fold selectivity over hSGLT1. Empagliflozin (BI-10773) is a potent and selective SGLT-2 inhibitor with IC50 of 3.1 nM, exhibits >300-fold selectivity over SGLT-1, 4, 5 and 6. Phase 3. 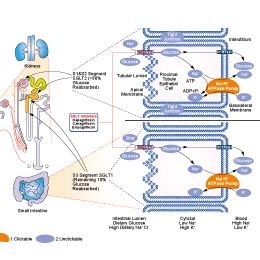 Canagliflozin hemihydrate is the hemihydrate form of canagliflozin, which is a SGLT2 inhibitor with IC50 of 2.2 nM for hSGLT2 in a cell-free assay, exhibits 413-fold selectivity over hSGLT1. Sotagliflozin (LX4211) is an oral dual SGLT1/SGLT2 inhibitor with IC50 of 36 nM and 1.8 nM, respectively. Phase 3. Ertugliflozin is a potent and selective sodium-dependent glucose cotransporter 2 inhibitor with IC50 values of 0.877 nM for h-SGLT2 and 1000-fold higher for h-SGLT1. Dapagliflozin propanediol belongs to the class of orally administered antidiabetic agents designated as sodiumglucose cotransporter 2 (SGLT2) inhibitors. Tofogliflozin is a novel sodium-glucose co-transporter 2(SGLT2) inhibitor with IC50 values of 2.9 nM and 8444 nM for hSGLT2 and hSGLT1, respectively. Ipragliflozin (ASP1941) is a highly selective sodium-glucose cotransporter 2 (SGLT2) inhibitor with an IC50 value of 7.4 nM for hSGLT2 and a 254-fold selectivity versus SGLT1. Phloretin is a dihydrochalcone found in apple tree leaves, which shows beneficial effects on diabetes. Phlorizin is a dihydrochalcone found in the bark of pear (Pyrus communis), apple, cherry and other fruit trees.